Steinthor returns to the Dane's Land! 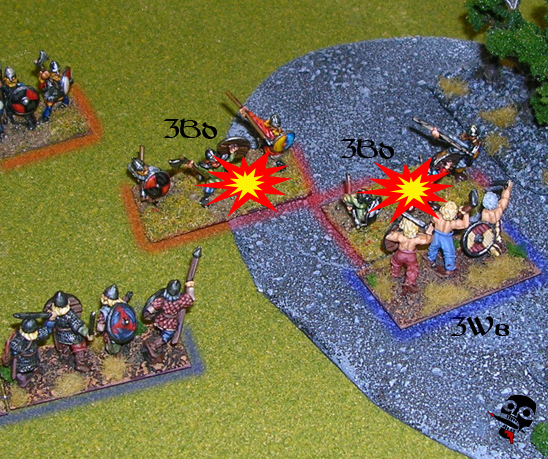 Chainmail rattled and spears clang off of sheilds as Steinthor's mighty host took to the field and formed their battle lines. Jarnskeggi, the Danish warlord who had been raiding Steinthor's brother's lands during the raiding season olbiged Steinthor's call to battle, and so his host did likewise. As the lines marched toward each other, Steinthor promised Jarnskeggi that he would take his head and hang it in his hall in the Brittons. Jarnskeggi just laughed... (Note that Steinthor's army glows a faint blue colour for easy recognition, while Jarnskeggi's army glows a faint red. Explosions denote destroyed elements. To win, one side has to destroy four elements). 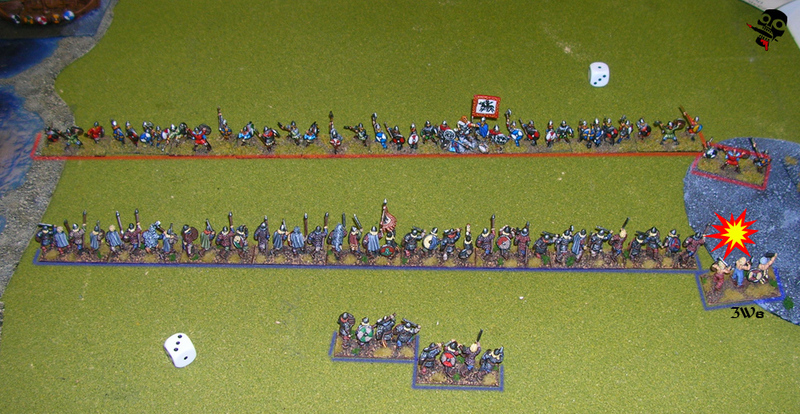 As the hosts lined up, Steinthor's berzerks kill Jarnskeggi's berzerks in a feirce forest battle! As the distance between the lines shrunk, Steinthor let his berzerks scour the forests. They found the berzerks of Jarnskeggi there in wait and battle was joined. Much blood was shed, but at the end, Jarnskeggi's berzerks were broken, leaving Steinthor's Berzerks control of the forest. The running battle in the woods continues, and Steinthor's berzerks hold their ground. Jarnskeggi decided he wouldn't hand Steinthor's berzerks control of the forest on right flank and sent in his karls to challenge the berzerks. They faught bravely, but their heavy armour and narrow eye slots kept them from getting the edge on the half-naked slathering berzerks, and two elements were cut down to a man. Vicious battle was had as the lines finally met. The lines finally met, and amidst the clash of axe on sheild, sword on chain, and spear on helm, not a single element was lost from either side. The sheild walls of both Steinthor and Jarnskeggi held. Victory was a wiff away from a reality for Steinthor, as all he needed was for his army to destroy one last element of the Danes... Just one... But even with his berzerks on the right flank Steinthor's karls couldn't win the day, and the sheildwalls would have to clash again! As Steinthor battled ruthlessly, Jarnskeggi closed in on him. His men were assailed from all sides. Axe broke sheild, sword shattered mail, and spear pierced helm, and many died on both sides of the line. But alas, in the end, Steinthor's men could not hold. With a sweeping chrage, Steinthor was forced to yield. His karls who could withdrew to their longships and made for the Brittons, hopeing to bring word to Steinvor Steinthorsson of the loss, and to gather a new host to make battle again with Jarnskeggi and his Danes and free the mighty Steinthor! Stay tuned to the Raid, Pillage, Loot cmapaign of Stienthor's exploits to see how his story continues!